Doha, Qatar – 20 March, 2017: Al Meera Consumer Goods Company (Q.S.C) held its Annual Ordinary General Assembly on Sunday, 19 March 2017 at the La Cigale Hotel Doha, in the presence of Sheikh Thani Bin Thamer Bin Mohamed Al Thani, Chairman of the Board of Directors, as well as members of the Board of Directors, shareholders and investors. All items on the agenda were discussed, such as hearing and approving the Board's Report for the year ended 31 December 2016, along with discussing and approving the Company's future business plans. This also came in line with hearing the External Auditor's Report of the year ended 31 December 2016. The company’s financial statements for the year ended 31 of December 2016 were also discussed. The Assembly approved the Board of Directors’ proposal on the distribution of cash dividends of 9 Qatari Riyals per share. Moreover, the Board of Directors were discharged from liabilities and the Assembly approved their remuneration for the year ended 31 December 2016. In addition, the General Assembly approved the External Auditors Report for the year ended 31 December 2016, and the adoption of the Company's seventh Governance Report and appointing the external auditor for the year 2017 and determining their fee. He added: “To live up to its motto of being ‘Your Favourite Neighbourhood Retailer’, Al Meera renovated more of its established branches in 2016, to match the Company’s new identity and bring its shopping centres across the country to the same undeviating level of customer service, product display mechanisms, modern facilities, and one-stop-shop convenience. Newly revamped branches include Rawdat Al Khail, Shamal and Gharrafat Al Rayyan. As part of the expansion plan, and having celebrated its tenth anniversary with the opening of 9 new shopping centres - in addition to its leased branch in Gulf Mall in 2015, Al Meera made strides in 2016 to transpire the Company’s 14-branch expansion plan announced during the previous year. The second quarter of 2016 saw the initial work on six new shopping centres, across various regions in the country, with a total area of 75,000 m2, covering areas such as Azghawa, Umm Qarn and Al Khor. In addition to that, Al Meera announced that it was in the final stages of preparations for five new stores that the Company planned to launch in succession for consumers in different regions across the country, thereby bringing progress to 11 out of the 14 shopping centre’s expansion plan. The five community shopping centres – located in Bu Sidra, North Sailiya (Al Miarad), Al Wakra (East), Um Salal Ali, and Leaibab 2 – will add approximately 8000 m2 of Supermarket Area to the Company’s presence in Qatar, noting that Al Meera had successfully opened two of the five stores before the end of the year, namely the Bu Sidra branch, followed by the North Sailiya (Al Miarad) branch. On the other hand, through the Company’s recent land leases in Oman, Al Meera Markets (Al Meera Oman) spared no effort on its plan to grow its network to reach 10 community malls spread across the country’s various regions by 2022. The current expansion phase comes as part of the Company’s mission to provide consumers across different locations of the Sultanate with a great shopping experience that provides true value for money, and to increase their market share in the nation. It is worth noting that measures had been taken to conduct studies on the projects that will be developed on every land, and such development will rely on the importance of the branch in relation to the Company’s performance in the Sultanate. Al Meera Oman’s latest conquest in its expansion plan transpired in September 2016, marked by the opening of the Company’s new store in Al Muzn Mall. By the end of 2016, Al Meera boasted a network of 47 branches, with 42 in Qatar (endowed with a total retail space of nearly 68,000 m², including its G�ant Hypermarket at Hyatt Plaza) and 5 in the Sultanate of Oman. 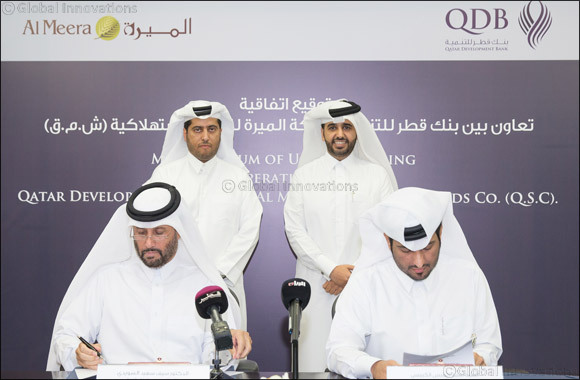 Al Meera’s expansion plan in the State of Qatar also includes the opening of new branches that serves students at Qatar Foundation for Education, Science and Community Development, following the signing of contracts for the operation of several spaces at the Education City. In addition to that, 2017 is set to witness the signing of a contract with Lusail Real Estate Development Company to operate and manage two community retail centres in Fox Hills and North Villas District as part of Al Meera’s strategy to cooperate with local companies. The company has also negotiated with the “Doha Institute for Graduate Studies”, and the Ahmed Bin Mohammed Military College for the operation of a supermarket in each. Fulfilling their promises, after the opening of two new stores in Bu Sidra and North Sailiya (Al Miarad), which feature Al Meera’s world-class customer service, product display mechanisms, modern facilities and one-stop shop convenience, have been followed by the opening of the Um Salal Ali branch in January 2017, which was followed by the official opening of Al Wakra (East) branch a few days ago. In addition, the Leaibab 2 branch is expected to be launched during the month of April, bringing the Company’s five-store expansion phase to fruition by the beginning of Q2 2017, which is part of a larger expansion plan including 14 shopping centers, announced in 2015. Moreover, Msheireb Real Estate Company, a subsidiary of the Qatar Foundation for Education, Science and Community Development, signed a partnership with Al Meera Consumer Goods Company to open a branch in Msheireb Downtown Doha (MDD). The mixed-use project, which is designed to revive the urban center of Doha, is located at the iconic project’s Galleria Mall, which forms a major part of its retail offering, Al Meera’s MDD Branch will bring to fruition years of experience in modern design and will be established in harmony with the nature of the place and its surroundings. The shopping centre will be divided into three main sections; the first will be dedicated to the supermarket, the second to organic products and the third to a coffee shop for organic products. The accumulation of the efforts to coordinate with the local farmers and marketing their quality Qatari vegetables (Premium Products) at Al Meera branches, was inaugurated by HE Mr. Mohammed Bin Abdullah Al Rumaihi, Minister of Municipality and Environment, in the presence of Sheikh Thani Bin Thamer Bin Mohammed Al Thani, Chairman of Al Meera Consumer Goods Company, HE Sheikh Dr. Faleh Bin Nasser Al Thani, Assistant Undersecretary of Agricultural Affairs, Livestock and Fisheries at the Ministry of Municipality and Environment, and Mr. Yousef Khaled Al Khulaifi, Director of the Agricultural Affairs Department, in addition to a number of Al Meera representatives and farm owners participating in the program. Al Meera’s active participation in the joint initiative between the Ministry of Municipality and Environment and the Ministry of Economy and Commerce, which represents an extension of the Company’s continued efforts to support and encourage local farmers and to provide consumers the finest fresh products at reasonable prices. Therefore, Al Meera plays an active role in supporting economic diversification by providing local farms the ideal channels to market their products through a wider range of retail stores in Qatar, and make use of the high turnout throughout their different branches.